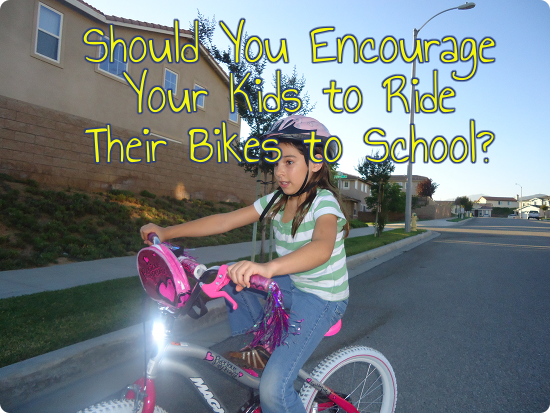 Should You Encourage Your Kids to Bike to School? Kids are steadily heading back to school across the country, if not now, soon. That means huge crowds of cars as parents hurry to get their children to class on time. These days relatively few kids get themselves to school, and I think that’s a shame. What if more parents encouraged their kids to walk or bike to school, as used to be normal? I’m a big fan of kids getting to school on their own. My older two walk to school. It’s easy, as we’re less than a quarter mile from the school. Only risky part is crossing the street to the school with all the parents driving in to drop their kids off. Close as we are, they don’t need to ride bikes there. I don’t mind if they do. They’d have to be extra careful as they got close to the school, maneuvering around all the people who parked in the neighborhood and are now walking onto school property. It gets very crowded around the parking lot, and bicycles have to be walked at that point. But how do you decide if it’s the right choice for your kids to ride their bikes to school? It’s healthier for them than riding in the car and better for the environment, but is it safe? Here are some points for you to consider. If your child’s school says they’re too young to ride to school, odds are you aren’t going to let him or her ride a bike to school. Some parents do take on this battle (can the school really say what your child does off campus outside school hours? ), but for many it’s simpler to go with the rules set by the school so the bike can stay at the school during the day. You also need to know where the bike will stay during the day. Our school has a fenced off bike rack where kids can lock their bikes up for the day. I’ve noticed that a lot of kids don’t even bother locking up their bikes beyond putting it in the bike rack. Personally, I’d tell kids to lock up their bikes even so, but I have to admit it doesn’t seem to have been a problem. Is your child good enough on his or her bike to ride to school and deal with the crowds upon arrival? Schools often want kids off the bike once they get on campus – things are just too crowded for a bicycle to be ridden safely. You not only want your child riding the bike well enough to deal with any traffic on the way to school, you want your child able to walk their bike without bumping into other people, and the sense to know when it’s time to get off the bike and walk it. Are you in a situation where you child could ride to school safely? Is the neighborhood generally safe? Are there any streets you don’t want your child riding on that can’t be avoided on the way to school? Does your child watch out for cars as they ride? Does your child’s bike helmet fit properly or is it time for a new one? Your child should know how to put it on correctly and agree to always keep the straps fastened while riding. I’ve seen lots of kids riding with bike helmet on but unfastened, and that’s not going to help in an accident. Be sure your child’s bike is in good condition for riding. Brakes work, tires well inflated, things like that. While a bike can develop a problem on the way, you want to minimize the chances for that to happen. It should also be the right size for your child. Not so tall that your child has trouble touching the ground when stopped, not so short that it’s uncomfortable to ride. Sometimes stuff happens when kids are out on their own. Make sure they know what to do about flat tires, crashes and so forth. You can decide if it’s worth it to have your child carry a cell phone (pay attention to school rules about cell phones) or if there are enough options for your child to get help if it’s needed on the way. Time to Haul Out Your Bike? It’s spring, and the weather is beautiful in much of the country. If it’s not, it probably will be soon. Have you ever considered biking to work? Or for your errands? With gas prices climbing ever higher (they will hit $4/gallon soon in my area, the way things are going), biking is looking more and more practical for a lot of people. It’s also great exercise. You don’t want to ride so hard that you arrive at work covered in sweat, of course, especially if you’re dealing with the public all day. If you’re within 5 or so miles of your work, this can be highly practical. It doesn’t take all that long to bike that far, and unless you have a lot of hills to go up you probably won’t need to sweat much to get there, except perhaps in the summer if you live in a place where it’s already hot by the time you leave for work in the morning. This is something we’re hoping my husband can do for his next job. While we’d like to stay where we are, if he ends up commuting a distance we’ll look at moving once my daughter’s out of school. No point in having him drive far just to go to work if we can live closer. If you have baskets on your bike, it can be highly practical for many errands. I remember when I was in college I would ride my bike to the grocery store and just carry the bags on my handlebars. A basket would have been much easier, with significantly less distraction and risk of breaking a bag. A challenge these days is where to store your bike at work or when you get to the store. A lot of places don’t offer a place to lock up your bicycle, a serious problem. When I was a kid all the grocery stores in my area had bike racks. Now I rarely see them, and I do look! Some jobs will allow you to bring your bike inside. There may be a storage closet or room in your cubicle for one, depending on the setup. It’s something to discuss with your boss if someone else hasn’t found the solution first. Stores can be more challenging. Most have trees in the parking lot, and many people use a cable to gently attach the bike to the tree. 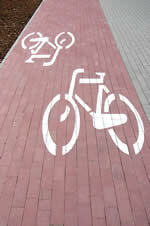 But no matter where you lock up your bike, make sure that you aren’t blocking walkways or ramps. You will want a good quality lock for your bike. U-locks are very popular, as they are much more resistant to theft than cables are. Square link chains are also quite strong. Make sure that when you lock your bike you lock the wheels to the body of the bike. It’s quite common to have individual parts of the bike stolen rather than the entire thing. Many bikes come with an easily removed front wheel, so you can pop it off and lock it to the body and the back wheel with little effort. You don’t need an expensive bike either. Keep it affordable and you can quickly pay off the investment in terms of gas money. Add in the benefits of the exercise you’ll be getting, and the advantages may be too much to resist. 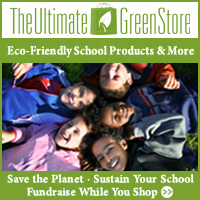 Published by Stephanie, in Budget Environmentalism, Going Green.